Credit: NASA. Download this image (JPG, 2.2 MB). 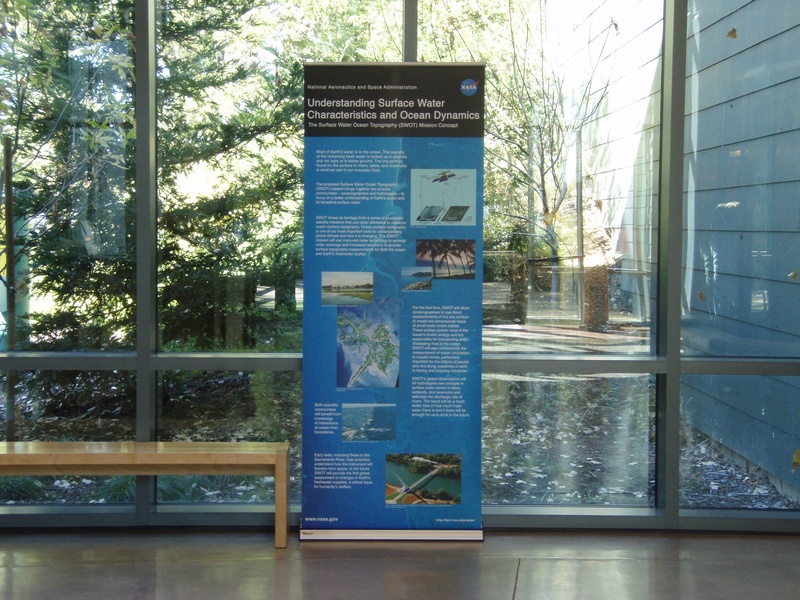 [01-Oct-08] This SWOT "Bannerbug" exhibit was created for display during hardware tests conducted during an eleven-day period in October 2008. To support ongoing radar instrument research, scientists and engineers made radar scattering measurements in different parts of the Sacramento river. The objective of the research is to provide validating data for the SWOT Ka-Band Radar Interferometer (KaRIn) instrument. The antenna used for the tests was adapted from the Mars Science Laboratory Ka-band radar. Data were collected from the Diestelhorst and Sundial bridges in Redding, California. In addition to the data collection itself, the campaign generated significant local interest with two (links removed) and a science seminar given by Ernesto Rodriguez at the Turtle Bay Science museum which is adjacent to the Sundial bridge. The exhibit remained on display at the museum throughout the tests.